September 30, 2015 by Ecommerce News. About Consumer behavior with tags Croatia, Slovenia. 5934 views. As part of the upcoming Web Retailer of the Year conference in Slovenia, an extensive consumer-oriented research about online shopping behavior in Slovenia and neighboring country Croatia was conducted. One of the interesting finds is that more Croatian consumers shop at foreign online stores than those in Slovenia. The study was conducted by Ceneje Group, a popular comparison shopping platform that’s active in Slovenia, Croatia and Serbia. The research is part of Web Retailer of the Year, a conference that was held in Croatia in March and will be held on November 24 in Slovenia. The research results show that the offer of online stores is more developed in Slovenia, although Croatia is closing the gap. But the most significant differences amongst these two countries however, exist in whether consumers like to shop at domestic or at foreign online stores. Although that might have something to do with the offer of ecommerce sites in Slovenia being more developed. Almost half of Slovenian online buyers (49 percent) shop only at domestic online stores, despite the high global competition. That means many customers can find what they are looking for online at Slovenian website, so they don’t need to look abroad. Online purchases in foreign stores are done mainly by young people. Ceneje also found out, by interviewing by about 5500 consumers, that almost one in four respondents (23 percent) make more than half of online purchases in foreign stores, out of which 8 percent carry out more than 90 percent of their online purchases in foreign stores. And 29 percent of Slovenian consumers make less than half of online purchases in foreign stores. 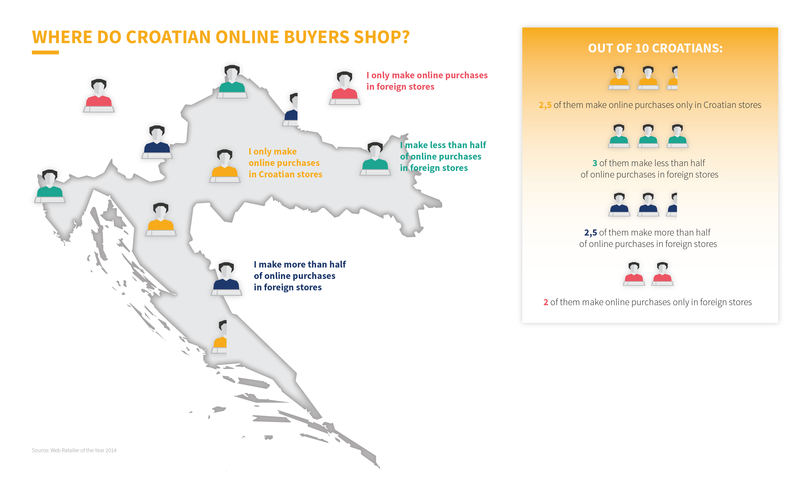 In contrary to consumers in Slovenia, Croatians are more inclined to shop at foreign websites. Research on 4866 surveyed consumers shows that only 24 percent of Croatian buyers shop exclusively in domestic online shops. Furthermore it shows that 32 percent make less than half of purchases in foreign online stores, 24 percent make more than half of purchases in foreign online stores, while 20 percent of surveyed consumers make more than 90 percent of their purchases in foreign online stores. Ceneje did not only ask consumers about their shopping behavior, it also looked at its own data. And it turns out domestic web stores lead by popularity, as there are only three foreign online stores among the 20 most popular stores. The situation at Jeftinije.hr, the Croation version of the portal, is somewhat different. Here, there also three foreign online stores in the top 20, but one of those foreign retailers is at the very top. “From this data it is evident that the users of the Croatian portal recognize foreign online retailers as relevant, and for them shopping abroad represents no major obstacles”, says Ceneje. Another research, done by Eurostat, shows that in Croatia the share of online shoppers has grown from 16 to 22 percent during the period 2012-2014, while in Slovenia this share grew from 22 to 26 percent. And while the percentage of enterprises using any computer network for sales was 15.1 percent in the European Union last year, it was 14.3 percent in Slovenia and 26.3 percent in Croatia. Web Retailer of the Year is a conference which this year will be about the link between physical and online stores. This theme will be illustrated through two characters: a woman who likes to shop in physical stores and a man who is more practical and looks for the easiest possible way to purchase products, so he buys everything online. During this event, the top online retailers will be declared too. It’s organized by Ceneje Group, which comprises of two companies in Slovenia and Croatia. It manage portals for comparative shopping in Slovenia, Croatia and Serbia.